Happiness, Too, Is Inevitable. 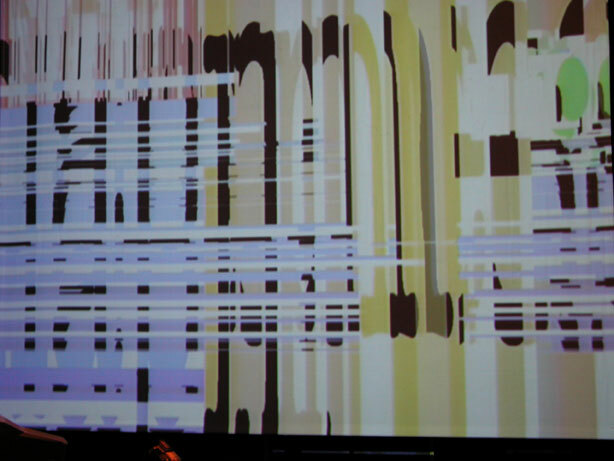 is an ambient audiovisual installation driven by data collected from its environment. Light, temperature, and pressure sensors inconspicuously installed around the space influence the sounds and images presented. The source of all sounds and images is the word "happiness." Given a very particular, and extremely unlikely, environmental state, the word "happiness" will clearly emerge from the jumble of sounds and colors. This perfect state is essentially unobtainable, and I find great joy in observing the alternate versions of "happiness" that do emerge. Happiness, Too, Is Inevitable. 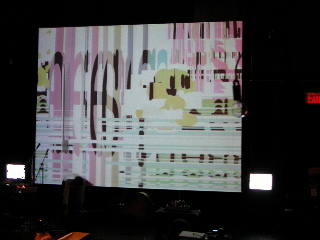 has been presented at the Festival of Mixology 2003 and the Listening in the Sound Kitchen festival.